This example shows how to examine data for nonrandom surface trends and anisotropy. You use simulated data where the variable is atmospheric ozone (O ) concentrations measured in Dobson units (DU). The coordinates are offsets from a point in the southwest corner of the measurement area, with the east and north distances in units of kilometers (km). You work with the ozoneSet data set that contains 300 measurements in a square area of 100 km 100 km. The result is a scatter plot of the observed data shown in Output 109.2.1. The scatter plot suggests an almost uniform spread of the measurements throughout the prediction area. No direct inference can be made about the existence of a surface trend in the data. 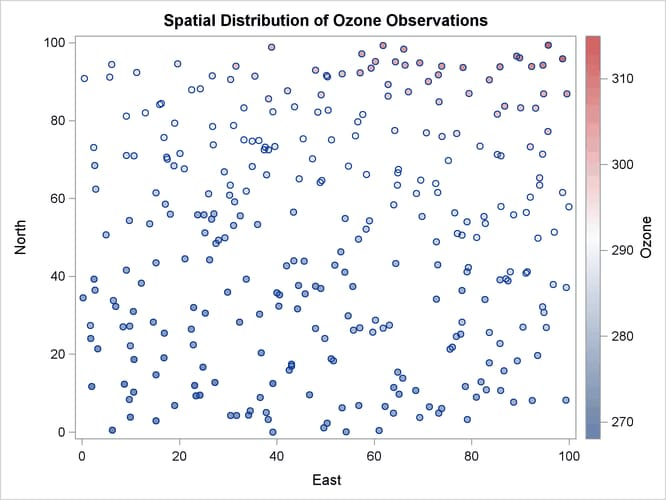 However, the apparent stratification of ozone values in the northeast–southwest direction might indicate a nonrandom trend. You need to define the size and count of the data classes by specifying suitable values for the LAGDISTANCE= and MAXLAGS= options, respectively. 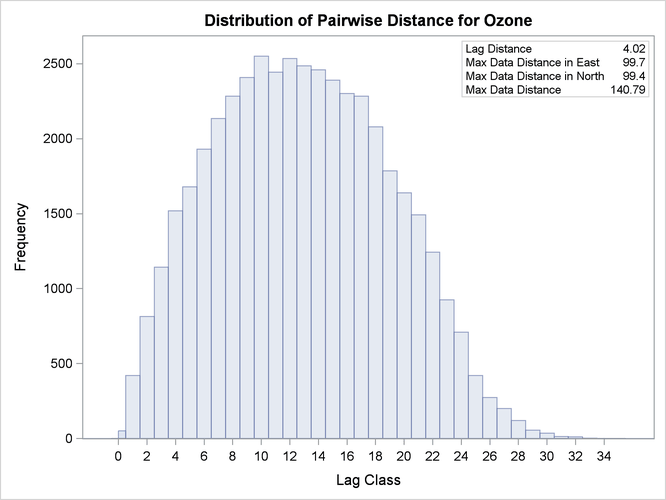 Compared to the smaller sample of thickness data used in Getting Started: VARIOGRAM Procedure, the larger size of the ozoneSet data results in more densely populated distance classes for the same value of the NHCLASSES= option. After you experiment with a variety of values for the NHCLASSES= option, you can adjust LAGDISTANCE= to have a relatively small number. Then you can account for a large value of MAXLAGS= so that you obtain many sample semivariogram points within your data correlation range. Specifying these values requires some exploration, for which you might need to return to this point from a later stage in your semivariogram analysis. For illustration purposes you now specify NHCLASSES=35. Your choice of NHCLASSES=35 yields the pairwise distance intervals table in Output 109.2.2 and the corresponding histogram in Output 109.2.3. Notice the overall high pair count in the majority of classes in Output 109.2.2. You can see that even for higher values of NHCLASSES= the classes are still sufficiently populated for your semivariogram analysis according to the rule of thumb stated in the section Choosing the Size of Classes. Based on the displayed information in Output 109.2.3, you specify LAGDISTANCE=4 km. You can further experiment with smaller lag sizes to obtain more points in your sample semivariogram. You can focus on the MAXLAGS= specification at a later point. The important step now is to investigate the presence of trends in the measurement. The following section makes a suggestion about how to remove surface trends from your data and then continues the semivariogram analysis with the detrended data.